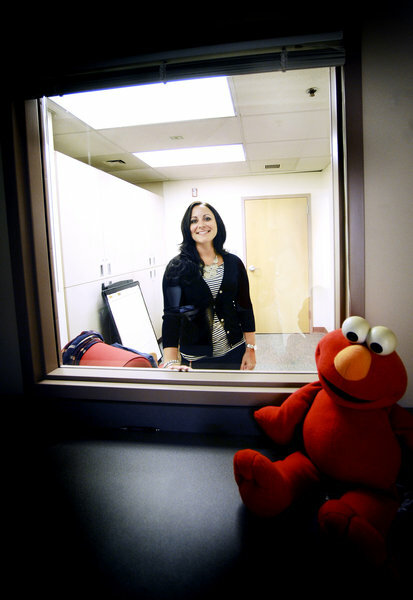 Sara Cohick looks through one-way glass in an interview room. Photo courtesy of the Herald-Mail. Due to confidentiality rules Sara Cohick, a licensed graduate social worker in Maryland’s Washington County, is not able to talk about the details of her work with children who may be physically or sexually abused, according to this article in the Hagersown Herald-Mail. Still the Washington County State’s Attorney’s Office and Victim-Witness Unit and Washington County Board of Commissioners commended Cohick for her work interviewing a young victim of sexual abuse. That victim’s testimony led to Charles Selby being sentenced to prison for 180 years for sexually assaulting the girl over a two-year period. The investigation leading to Selby’s conviction had lasted two years. The child was abused starting at age six. Cohick said it took time until the girl was ready to talk about what had happened. “It was one where you have to wait. This job is very frustrating. Sometimes a child’s not ready to disclose,” said Cohick, who works for Safe Place, the county’s child advocacy center. Cheers to the Herald-Mail for highlighting the valuable services social workers in child welfare provide. Social workers help protect the most vulnerable in our society, including children. To learn more visit the National Association of Social Workers’ “Help Starts Here” Kids and Families website by clicking here.